Since we are getting close to The Masters, I figured I would give some metrics of the year-to-date performance on Tour. 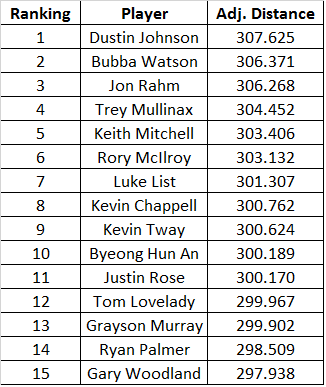 First up, Adjusted Driving Distance on All Drives. This metric takes the total distance off the tee on All Drives measured by the ShotLink laser. This is different from the traditional driving distance measurement which uses 2 holes in each round to measure driving distance. Thus a long hitter can lose distance if they are laying up more often and a short hitter can gain more distance if they are hitting driver when others are laying up off the tee. The adjustment is based on how far the average player in the field was hitting the ball in the events the player has played in. For example, the average distance on all tee shots at Pebble Beach was only 271.9 yards while at WGC-Mexico it was at 304.2 yards. I will provide more top-15 metrics year-to-date on the blog throughout today.